Now that my champion is into Moria, I’m going to beeline the epic storyline and seek the exit. I could just zip my way out since I know the way but I’m going to play through the epic storyline and refresh my memory. 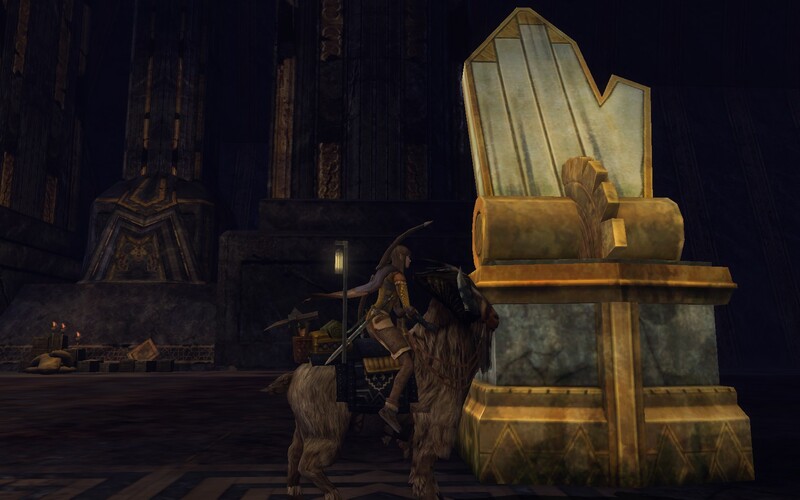 Not that Moria isn’t a great expansion – I certainly enjoy it – it is just that I’ve seen way more of the early parts of LoTRO (Eriador through Moria) than I have of the content past Mirkwood. I do plan to continue playing my Rune-keeper from Evendim so I will revisit those earlier areas, but also focus on getting my champ along to Galtrev and eventually Rohan, where Dhrun is. AutumnTian arrived at the 21st Hall, where Vol 2 Book 2 ends, at level 54. Vol 2 Book 3 is listed as a level 56 quest, so now I need to backtrack a little to level up. I suppose I could just go for it, but I want to play along at the recommended level, and also keep my undying streak alive, haha. I know that the Water-works is coming up, so I delayed further exploration into Silvertine Lodes (unless I need to for leveling) until the epic quests take me to the Water-works. Instead, I will return to Durin’s Way and work the quests north of the Chamber of the Crossroads – the goblins in the Hall of the High Stair, and over to the east towards the Stone Hall, which is north of the 21st Hall. I notice some revamping of quest lines in Moria. Deep Descent used to have all the quests, but now there are a few to find other quest givers (e.g. “Following the Winding Road”). There is a quest to arm a dwarf-trap and lure a goblin chief – now there is a secret passage by the quest giver… I remember fighting through the camp just to get there. These are minor changes that do improve the flow of the zone. The mirrors quest was also moved from Dolven-View to the 21st Hall. And on top of that somebody came through and stole all the Khazâd ore and replaced it with Khazâd skarn! I jest – this is a naming change I must have missed along the way, much like how old timers will remember there was once Misty Mountain iron and silver, and now there is Ancient iron and silver. I remember Skarn showing up as I adventured into Enedwaith with Naerys and Dhrun, and just assumed that’s what the higher tier nodes were called, but the renaming must have stretched a ways back too. I do like how Turbine pays attention to little things like this. It bothered me that Autumntian, my new champion, was only an apprentice prospector so I detoured to take care of a few things I skipped via the Gift. 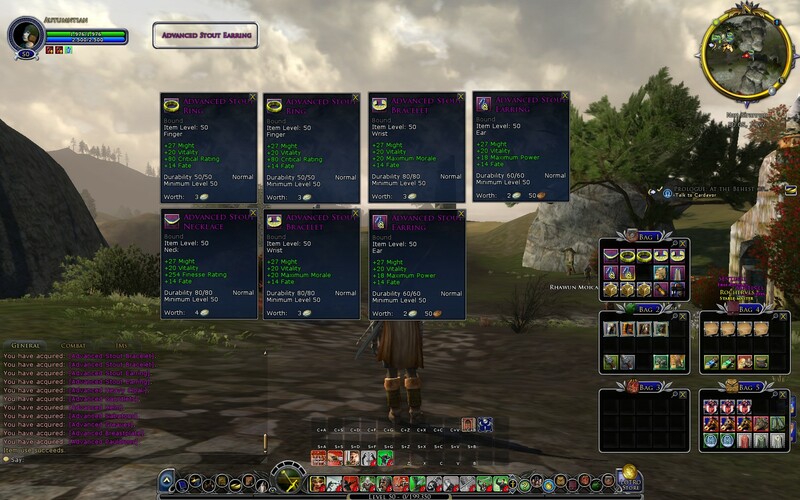 I went back to do class quests, the level 15 and level 30 one, earning the Martial Artist and Blade of Reknown titles. Yes, they were super easy since I was level 50, but I wanted to do them for completeness. 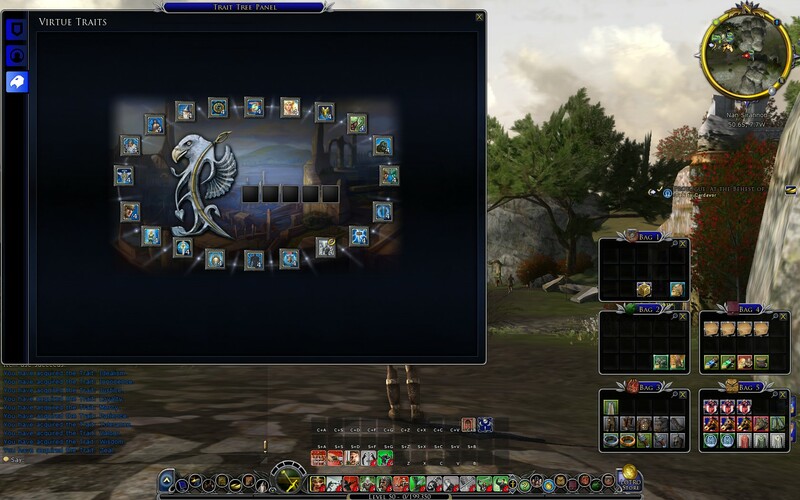 One minor goal I have is to see all the class quests – the level 15 and level 30 ones – and with the champion quests completed, I only have the level 30 captain quest remaining. And I also mined my way from apprentice to master prospector. Now I’ll be able to mine ore in Moria. This one Ancient Iron Ore looks like all the others, but it is special. This is the one that resulted in enough ore to finish the master tier of prospecting. It had a great view towards High Hollin! I only mined enough to open the next level of prospecting – I didn’t collect enough to allow for critical success. That’s too much gathering. 😉 It wasn’t too bad, because at level 50, all the mobs for the earlier tiers were grey, so I didn’t bother them and they didn’t bother me – gathering went relatively fast. Once I was ready to mine ancient silver and ancient iron, I returned to Echad Dúnann and entered the Walls of Moria instance. The goal here was to get a legendary weapon, then level it while doing some light questing and final resource gathering in Eregion. Soon enough I earned enough item experience to level my legendary sword to 10. 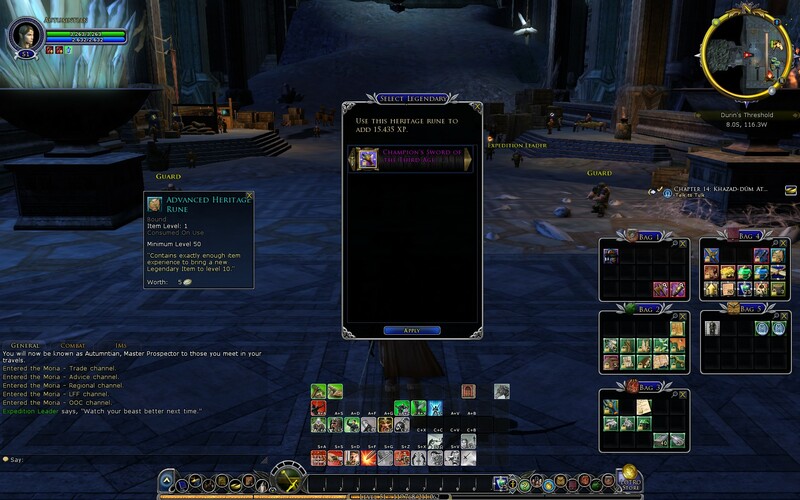 I completed the legendary item tutorial and entered Moria! 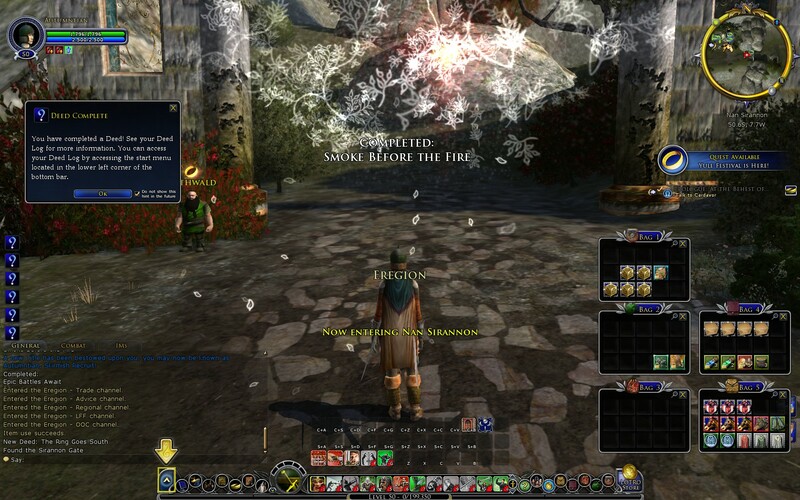 Exploring past Durin’s Threshold will wait until after the holidays. So far this character feels strong enough to handle at-level content. I didn’t have any trouble in combat, even when picking up an add in Filgogân. The armor is pretty good – I checked on Naerys, my metalsmith, and level 51 Sellsword armor is only slightly better if the piece is a critical success. By level 54 I’ll be replacing various pieces (and hence why I was keen on getting Autumntian to the proper level of ore prospecting). The only real weakness, compared to a character that leveled “normally” is with virtues. Those were always minor stat tweaks anyways. As I was looking through my bags I noticed a heritage rune. 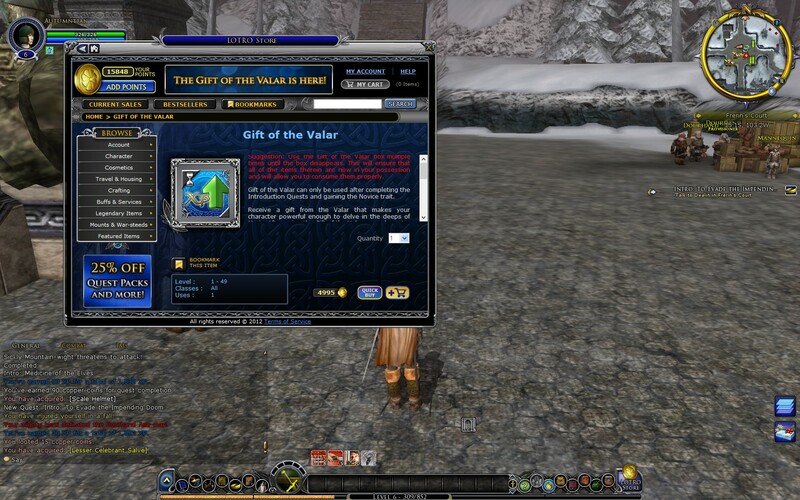 It seems I left that off my earlier screenshots of what is provided with the Gift of the Valar! Oops. The rune “contains exactly enough item experience to being a new legendary item to level 10” which happens to be 15435 xp. Guess I didn’t need to quest to level up my legendary sword to level 10. 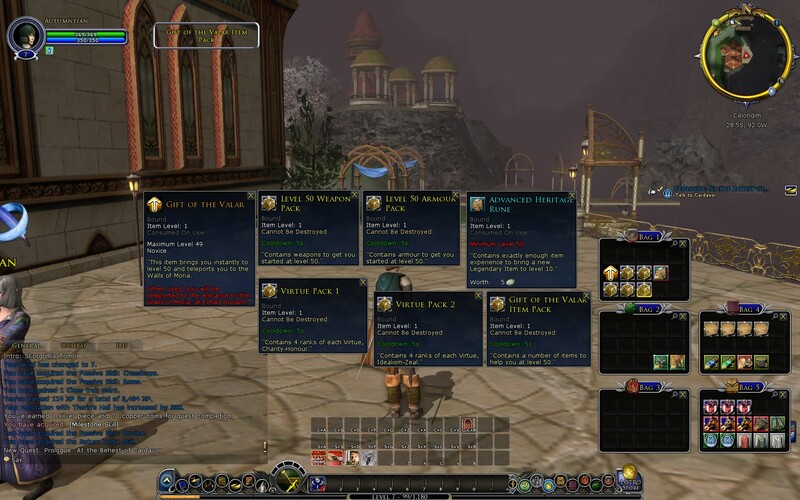 Well, I did want to gather ore and it was fun to revisit a bit of Eregion while questing. And I’ll use the rune now, so it isn’t wasted. 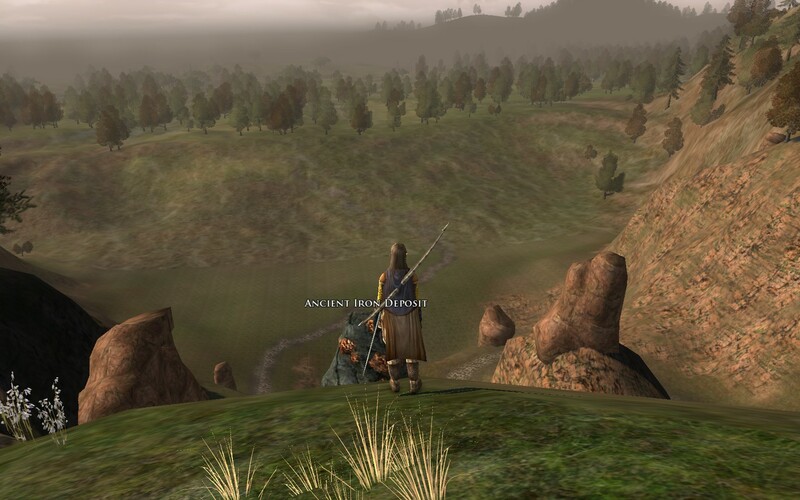 Before using the Gift of the Valar, I ran over to grab the horse route in Celondim. Then I used the gift, and was immediately transported to Echad Dúnann, as promised. I turned around for a scenic landscape view and examined my other goodies. First up was the Level 50 weapon pack, which gave me an Advanced Sword and an Advanced Bow. No pocket item was included, but I had a Derudh’s Stone for that slot. Unfortunately, no racial traits were included. 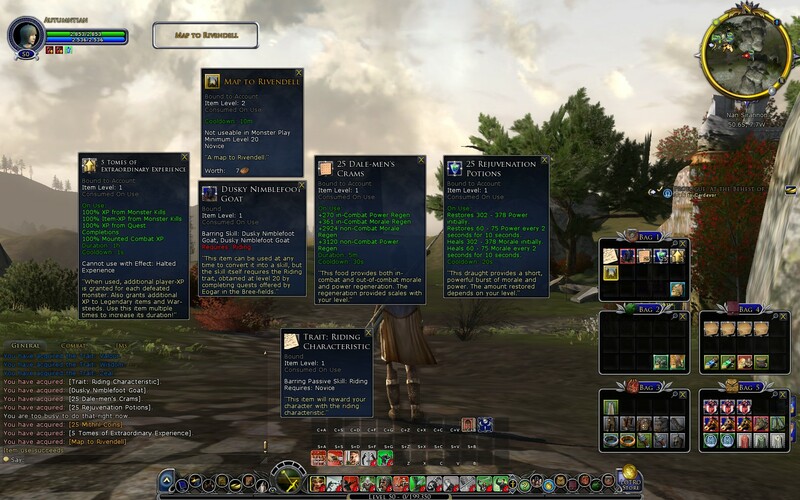 The Elf traits are on the LoTRO Wiki, and I’d definitely like to have Silvan Shadows, Return to Rivendell, Eldar’s Grace, and the Elf One-Handed Sword-damage bonus. The good news is those traits are earned by killing goblins, orcs, and drakes, which I should have no trouble finding in Moria! Anyway, I wrapped up by binding to the milestone at Echad Dúnann. 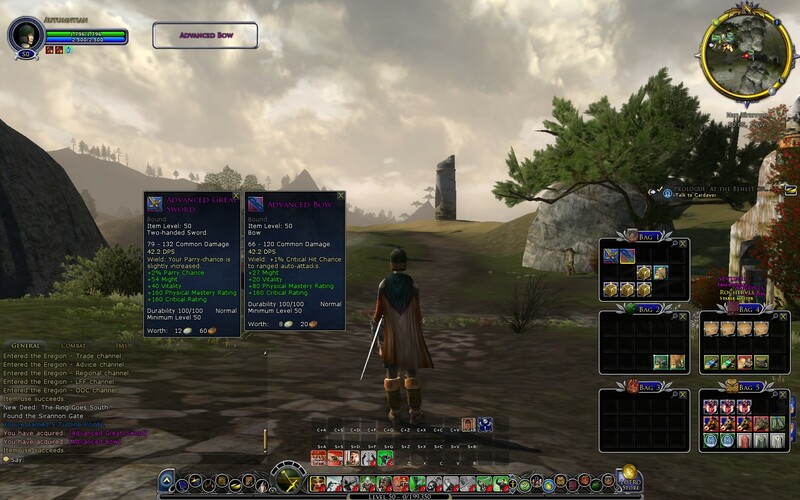 And, I bought a Milestone 2 skill from the store, along with Hurried Traveller. I checked with the Champion trainer and I was granted all active and passive skills up to level 50. So I need to read over those skills to learn what I have. Crafting, unfortunately, was left behind. If I want to gather materials, it looks like I’ll need to take this char back to the beginner zones and start there. This is kind of annoying as the materials in Eregion are at the Master and Supreme tier, Moria is the Supreme tier, so I can’t gather anything unless I work up from Apprentice first. Ugh. I closed the UI before doing anything, as I’d like to read through my existing skills before allocating trait points. Next up I will plunge into Moria. Or more accurately, talk to Ráthwald and pick up a quest. I’ll need to play a bit and see how “ready” this new level 50 is for Moria, so I’ll check back in after a bit. P.S. One thing I did notice is that I was not awarded any of the Survival titles – other than “The Wary” (I reached level 5 in the intro instance). So no cheating and getting a free “Undying” title by using the Gift of the Valar! As it stands, my champion is undefeated at level 50 so I’ll see how far I can go with that. 😉 My best yet was my rune-keeper who made it to 27 or 28 before succumbing to the wights of Garth Agarwen. … but nobody bought it (that I read about). So I decided to check it out. You see, this item is tailored made for a player like me! Why is that? Well… I have 2 lifetime accounts. One has 6 characters, including Naerys my guardian (currently level 89) and Dhrun my burglar (currently level 82). These are the two I continue to play. 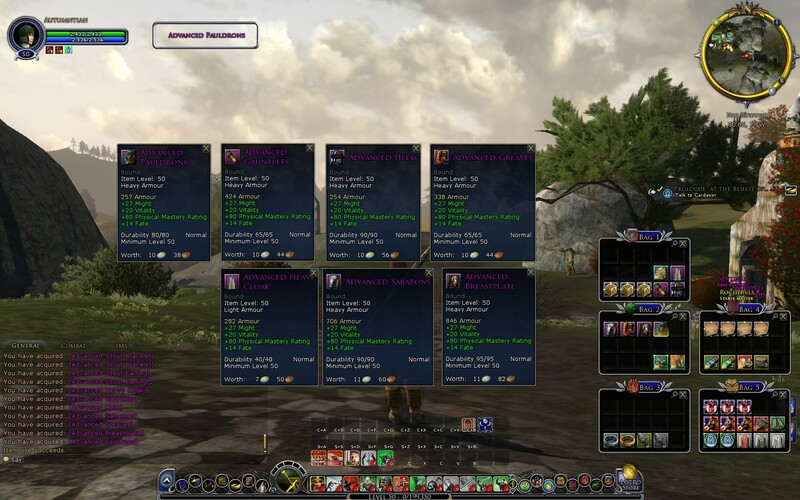 The others are a lore-master (level 65), hunter (level 61), minstrel (level 62), and warden (level 61). 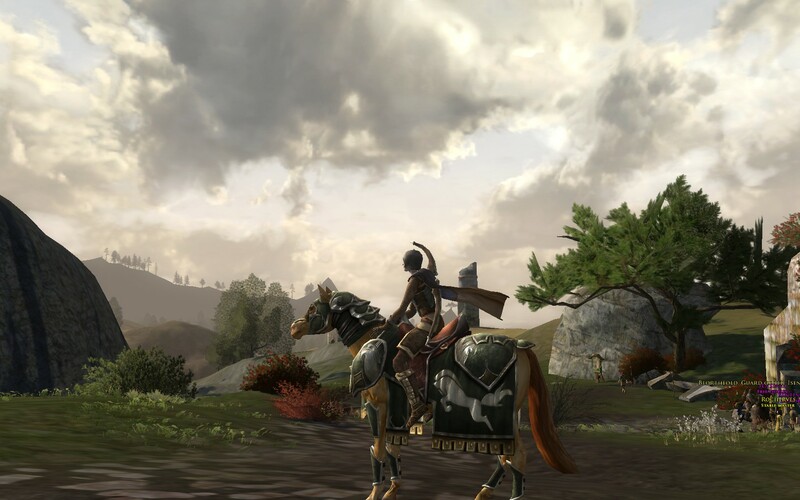 I’ve put all of them through everything up to Lothlórien and the latter four are semi-retired, hanging out in Caras Galadhon at Telain Galadhrim, which provides convenient access to a vault, auction hall, crafting, horse routes to major areas, and has nice scenery. My other account has a champion (level 7), warden (level 7), captain (level 28), and rune-keeper (level 36). As you can see, not played nearly as much. But it still gets 500 Turbine points a month since it was a former lifetime account. My first account, I actually use the points to get little things here and there. I also buy points once in a while, especially when they go on sale. My second account… has built them up for a long time. In fact, I have a little under 16,000 points on that second account. I could bump a few chars up to 50, but I decided to use it on a champion. My rune-keeper is already in Evendim, meaning leveling to 50 would skip Forochel, Trollshaws, Misty Mountain, Angmar and Eregion. Besides, level 50 is just 14 levels away. My captain is somewhere between Lone-Lands and Evendim. Level 50 is 22 levels away… tempting. I started a new hobbit warden, because hobbits are awesome and I should have made my warden a hobbit instead of an elf. And on the second account instead of the first, to better balance out my accounts. Plus, I like the quests in the Shire, and learning all the gambits at the same time is tough. And so not the throw champions under the bus, but learning their skills “all of a sudden” would be a lot easier than rushing the captain, rune-keeper, or new warden to 50. 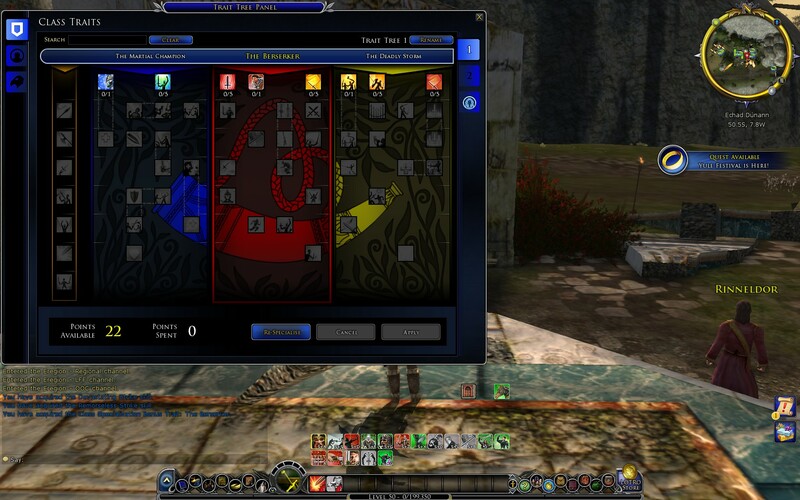 To use the Gift of the Valar, the character needs to have the Novice trait, meaning they’ve finished the intro instance. So I put my brand new elf champion through it real quick and made the store purchase. In my next post I’ll actually use these items, and see how my newly minted champion winds up. I’ve put 6 characters through all of Eriador and Moria. Honestly, I’m kinda excited to short circuit a new character past Eriador and be that much closer to the content of Mirkwood, Isengard, Rohan, Helm’s Deep, and beyond. 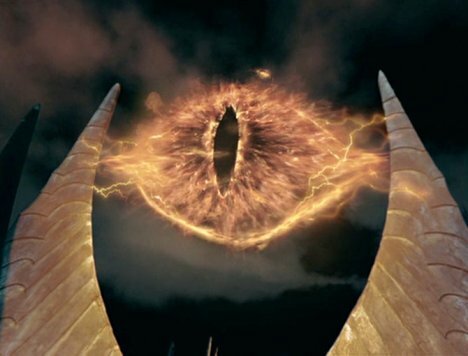 Yes, I realize Riders of Rohan came out last year, but I only advanced my guardian Naerys to that content. I had fallen quite behind from the days where I had 6 characters through Moria, all awaiting Seige of Mirkwood! 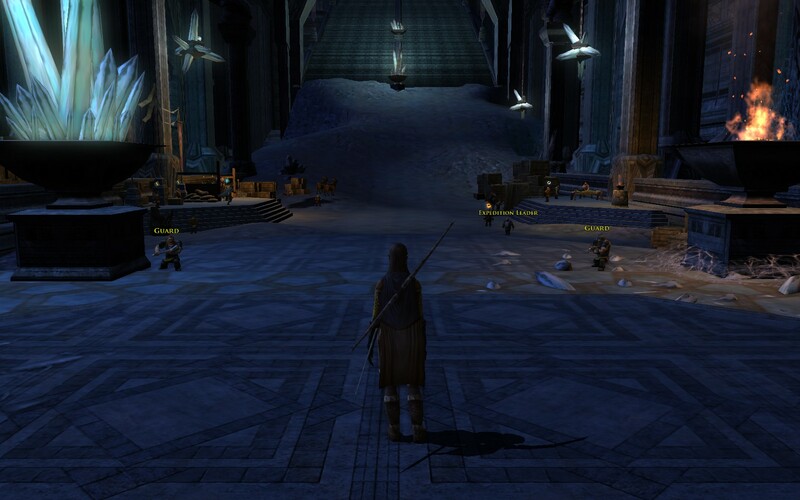 So when Turbine implemented the 100% experience bonus in the days leading up to Helm’s Deep, I took advantage of that and dusted off my burglar Dhrun. 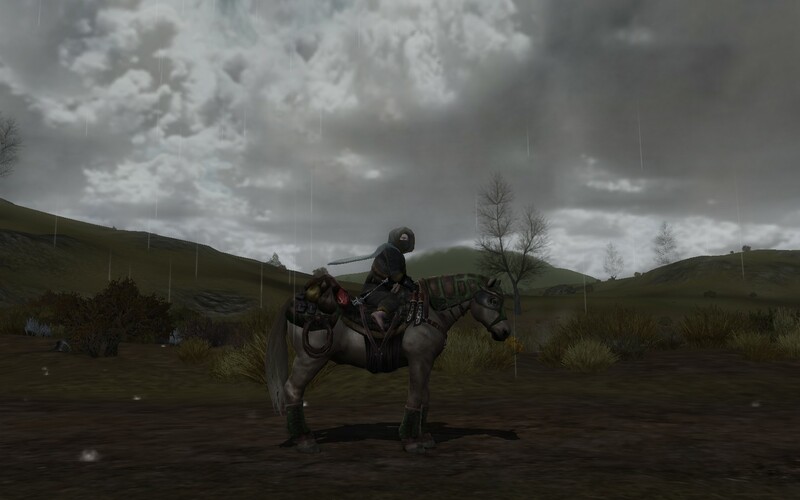 And in a very focused fashion, advancing the epic storyline as much as possible (my definition of that: whenever the storyline quest level was lower than my character level, advance the storyline), Dhrun finally arrived at Harwick and earned his War-steed! Dhrun is now level 81, starting from 67 or 68 just a few weeks ago. Whew! I played the Gambler traits when they first became available, but switched over the Quiet Knife for the past few… years I guess (!). With the new trait system, I continued with Quiet Knife, spending a few extra points into Mischief Maker to open up Dust in the Eyes, since that is now a skill earned in the trait tree. I’m not sure how I feel about that, but I’ll give it a shot. Also missing, due to the trait trees in Helm’s Deep, is Mischievous Glee. It is replaced by a trait that grants healing on critical hits, but that doesn’t seem as nice because MG is in “my” control (apply trick, remove it with MG and get some healing) where this is a side effect I don’t control. Still, I’ll give it a shot. Since Dhrun is about 5 levels over the mobs at the moment, he certainly doesn’t feel squishier like some have mentioned on the forums. Most mobs die with a pass through the crit chain plus an extra hit or two. I’ll see how that goes when the ambient content level is closer or equal to Dhrun’s! My other characters, besides Naerys, are in various states of crafting. They are all hanging out at Telain Galadhrim, or in the case of my yeoman Suldrun (who in a previous life was a minstrel but now just farms and cooks full time), Michel Delving. 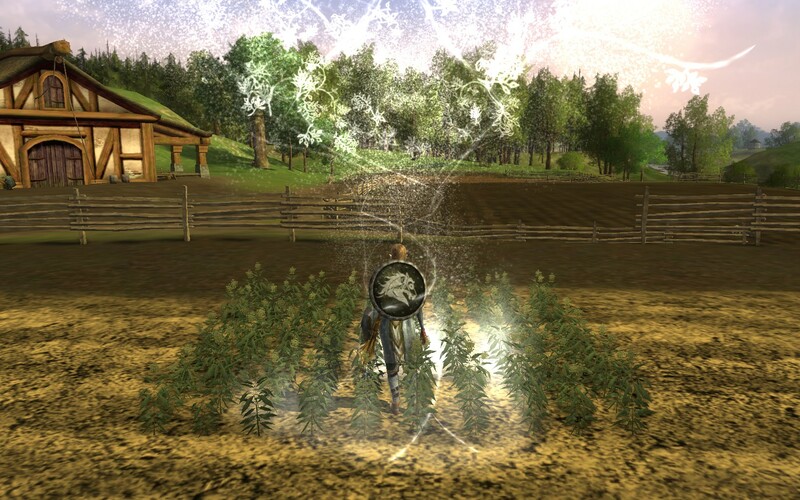 Above is an amusing shot of her leveling while growing crops. Suldrun hugely overproduced Bilberry Pies so my hobbits will have food to eat for many months. 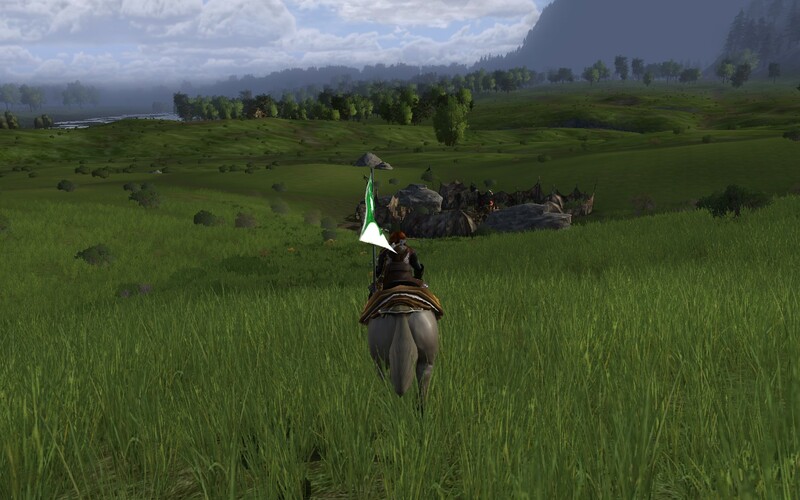 Naerys is a few books ahead of Dhrun in the epic storyline, and is currently wandering the fields outside Edoras. She recently battled Asgája, an Uruk Captain that was threatening the village of Entwade. He succumbed so Naerys hurried back to Entwade to bring the good news to the Thane. For her part, Naerys spent points in the Fighter of Shadow trait tree. Historically, she drew most traits from the Defender of the Free, and decided to mix things up a little and try something different. While it was fun having the Juggernaut skill, which is great for a female hobbit guardian 😉 the new Cataclysmic Shout is also a great one for a tiny character.